UNIVERSITY PARK — It seems like a lifetime ago, the 2015 season opener, when Brandon Polk burst onto the Penn State scene. What most will remember about his first game, a 27-10 loss at Temple, is that Christian Hackenberg, seemingly wearing cement shoes behind a matador offensive line, was sacked 10 times. What most probably won’t remember is how Polk, a speedy little freshman receiver and still one of the Nittany Lions’ fastest players, appeared to be a significant part of the game plan. 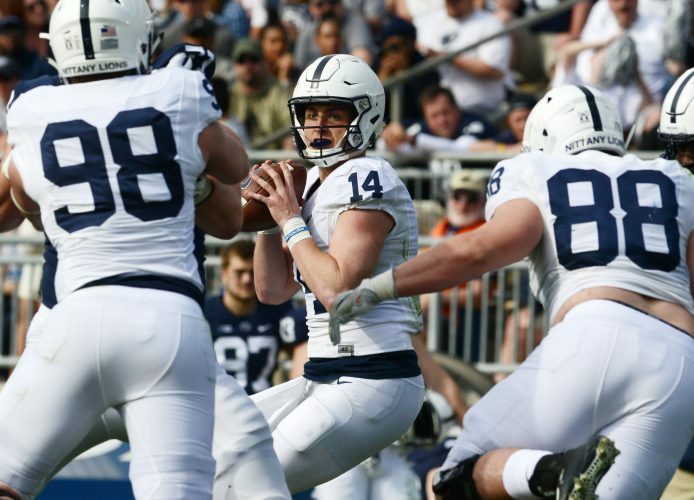 In what was a new wrinkle in then-offensive coordinator John Donovan’s offense, Polk took the Nittany Lions’ very first play from scrimmage on a jet sweep and raced 33 yards up the sidelines. “I just remember on the first play, they gave me the jet sweep, and I almost felt like I was in high school again,” Polk was saying at Penn State’s media day. “The way I was coming across and getting the ball and doing what I could do in the open space … it was a very exciting game for me. Polk carried three times against the Owls for 50 yards and was used enough in the run game to finish the season with 159 yards while averaging 8.8 yards on 18 carries and a touchdown. But he pretty much hasn’t been heard from since. The Lions’ obviously found a better running option in Saquon Barkley (who carried once in that Temple game), and Polk hasn’t carried at all in the last two seasons. He was a backup receiver last year, pulling in 10 receptions to set his career total at 18. With all-time receiving leader DaeSean Hamilton lost to graduation, not to mention prolific tight end Mike Gesicki and deep threat Saeed Blacknall, Polk is still around waiting for another extended opportunity. Juwan Johnson, whose last-second touchdown reception from Trace McSorley defeated Iowa last year, has established himself as the top returning receiver, but the position is still well stocked with DeAndre Thompkins and heralded underclassmen K.J. Hamler, Mac Hippenhammer and true freshman Justin Shorter. “We’ve got a great group of receivers this year, a lot of guys giving effort,” first-year receivers coach David Corley said. “There’s going to be a lot of competition. Polk, whose 4.39 was the fastest of the wideout in PSU’s winter workouts, played at the same high school in Virginia, Briar Woods, as McSorley. His freshman cameos whet his appetite but also taught him about becoming a more complete receiver. His maturity has impressed his teammates. “Brandon has always been putting in work behind the scenes, as a student of the game,” Johnson said. “He was blessed to have the opportunity under his belt as a freshman. Not a lot of guys get that. He could have a huge role this year.